Apollo Zeus review | What Hi-Fi? Form follows function closely where most speaker stands are concerned, and these new Zeus supports from Apollo couldn't be mistaken for anything but what they are. 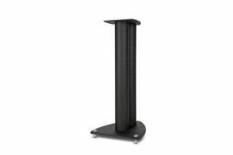 Sure, they're beautifully made, with vaguely interesting curves to the top and bottom plates, but the crackle-black finish and sturdily machined floorspikes are familiar from many speaker stands down the ages. Supporting a pair of EB Acoustics' EB1s, the Zeuses are of the ‘solidly effective' rather than ‘sparkling crowdpleasers' school. Florence & The Machine's charge through You Got The Love is underpinned by controlled and articulate low frequencies, and there's gratifying openness to her midrange stridency. In terms of detail retrieval and outright resolution, the Apollos want for very little. There's not quite the dynamic control or headroom of their best competitors, though, and that's where the fifth star has gone. There's a vague sense of inhibition where dynamics are concerned – but this is a minor failing considering performance as a whole. And as Apollo can build Zeuses to whatever height and finish you desire, they're well worth adding to your shortlist.